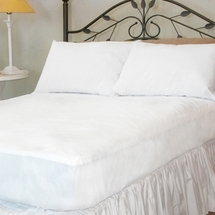 Give your kids a comfortable place to sleep each night while protecting their mattress at the same time from any potential late night “accident” with a waterproof mattress pad from Laurens Linens! In addition to our regular line of mattress pads and covers, we also carry an extensive array of bedding protection just for kids. The extra protection of our waterproof mattress pads and covers means a good night's sleep for both parents and your child. 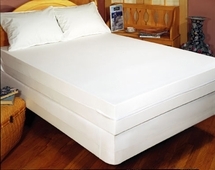 Our inventory of durable waterproof mattress pads includes both flat and fitted kids mattress pads, as well as portable waterproof kids mattress covers and allergy relief mattress pads. Our current available selection offers a wide range of options to fit any sized kids bed from cradle and crib sizes to twin and extra-long twin, as well as all the normal sizes for any standard size mattress. If severe bed wetting is a problem, we also have vinyl kids mattress covers for kids in fitted and zippered styles for extra protection under your child’s regular or waterproof mattress pad. 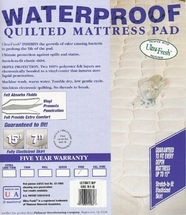 When ordering kids waterproof mattress pads, we highly recommend ordering two pads for each bed. This way you know that you will always have a back-up mattress cover available after that inevitable "accident". 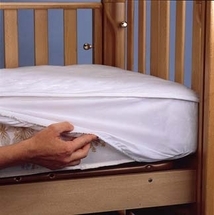 Each of these waterproof mattress pads for kids is also machine washable for extra easy care!